With almost half the world’s population tuning in to the 2018 world football event, high-resolution and reliable, live video of the games was critical to broadcasters throughout the globe. Some of the worlds’ premier public broadcasters trusted FOR-A to deliver the most pristine imagery in a multitude of formats to fervent fans watching the quadrennial event. Broadcasters in Japan, Korea, and the European continent deployed FOR-A technology to ensure audiences all over the globe received glitch-free views of the entire contest. Four FOR-A FRC-9000 4K/HD frame rate converters or HD and SD signal conversion one FOR-A MFR-8000 4K/8K routing switcher were used by European broadcasters to supply properly formatted live coverage. A premier Japanese broadcaster went with six FRC-9000 frame rate converters for error-free live broadcasts of the month-long contest from Russian to its viewership in Japan. A broadcaster in Korea selected a total of 18 FRC-9000 frame rate converters for its coverage, with two of the converters being used within a 4K production system, and the remaining providing conversions within an HD system. 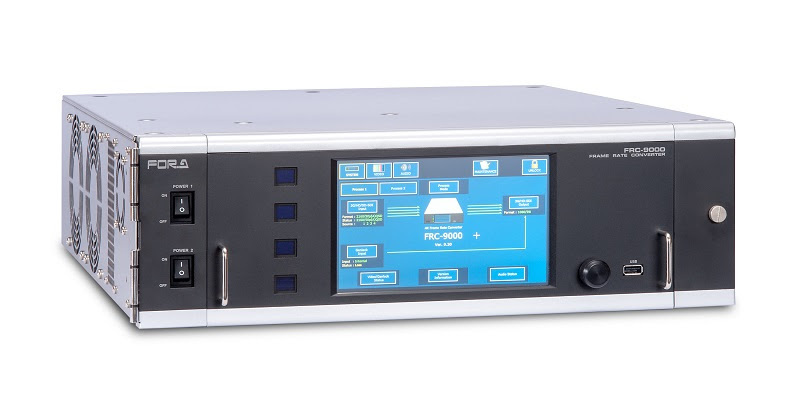 The FRC-9000 4K/HD frame rate converter supports 3G, HD, and SD. It provides SD to 3G/HD up conversion, interlace to progressive conversion; conversion with motion compensated processing, optional 4K (UHD, SQD/2SI) support, and simultaneous conversion of two-channel video inputs. MFR-8000 4K/8K routing switcher features an expanded matrix of up to 256 inputs/256 outputs in a 16U frame. It has a 12G-SDI I/O and gearbox support. It supports 3G-SDI(Level A/B), HD-SDI, SD-SDI and ASI signal input/output with automatic signal type detection.